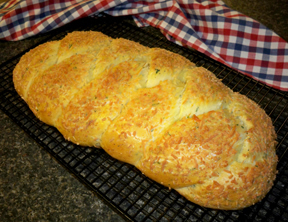 A pretty braided bread to serve at any meal. This flavorful, crispy crust, potato bread makes a perfect side to serve with soup, chili, and stew, or as an accompaniment to a meat and potato meal. 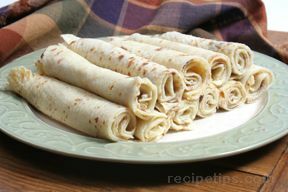 It also is great dipping bread for many savory type dips. 1 package yeast - dry active, 1/4 oz. Peel and cut potato into cubes. Chop the onion and place it in a small saucepan with the potato cubes. Cover with water and bring to a boil. Reduce the heat once it is boiling; then cover and simmer until potatoes soft when poked with a fork (10 to 15 minutes). In a large mixing bowl, combine the egg, butter, honey or syrup, cheese, parsley, salt, pepper, yeast (dry-do not mix with water), warm milk, mashed potato mixture, and 3 cups of flour. Mix all ingredients together until well mixed. Add enough of the remaining cup of flour to make the dough just stiff enough to be able to knead. Mix in with hands if necessary. When just stiff enough to knead, place the dough on a lightly floured surface and knead the bread for approximately 8 minutes. When done kneading, divide the dough into 3 even sections. Working on the floured surface, roll and form each section into an 18" long rope. Place the 3 ropes on a large greased baking sheet. Gather the 3 ropes at one end and then begin to braid the sections together. When you have the entire loaf braided, pinch each end together and tuck under. Cover the loaf with a light kitchen towel and place the loaf in a warm place to rise. Allow the loaf to rise to double in size. This should take approximately 60 minutes, depending on how warm the area is where it is place. Once the loaf has double in size, brush the top with the egg wash and sprinkle with extra parmesan cheese. Preheat oven to 350° F. and bake for 30 to 35 minutes or until it is a nice golden brown. When done, remove it from the baking sheet immediately and place on a cooling rack. When cooled, it is ready to slice and serve. "Well worth the work to make this bread. It was delicious and made a very large loaf. 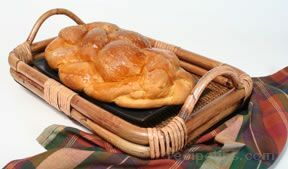 This bread would be great for sandwiches, dips, soups and stews, or just as a side for any meal."